I will be using this Kaggle data set which contains wine reviews, the rating of the wine (measured in points) and other relevant information scraped from WineEnthusiasts. The data set contains two files scraped on separate days. 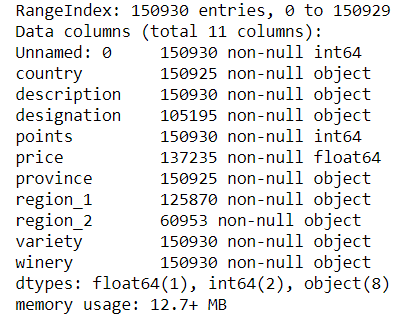 I will be using the file winemag-data_first150k.csv as the training set and winemag-data-130k-v2.csv (scrapes from a later date) as the testing est. Here is the repository for the code. WineEnthusiasts use a points scale ranging from 1 to 100 to rate their wines (1 being the worst, 100 being the best). Unfortunately, the website only posts positive reviews, which is why the range of the scores in the data set only range from 80 to 100. This means that our data set is not representative of the problem we are trying to tackle. Any models built using this data would only be applicable to well received wines. Before we start with our analysis, we should try to gather some domain knowledge. After exploring the website and reading some other wine related resources, I found a nifty classification system based on the points system. To an end user (i.e. wine shopper), the points are only as important as the information they convey. If we frame this as a classification problem with the above breakdown, we can retain the necessary information on wine quality while reducing the dimensionality of the problem. The next step is getting to know our data a little better. This can give us important insights to tackle the problem better. In addition to the review and rating, there are other relevant information such as the wine price, variety (grape type) and location the wine was produced. If we wanted to build a more comprehensive model, we can also include these features as predictors to determine the quality of the wine. To combine text descriptions with other predictive features, we can either create an ensemble model (with the text classifier being one of them) or a hierarchical model where the results from the text classifier will be used as one predictive variable. For the purpose here, we will only be exploring the relationship between the review and wine score. There are no missing entries from the points and description column. As we have noticed before, the wine points are shifted to the right. From my personal experience, the prices are also shifted to the right. The reviews look very “clean”. There doesn’t seem to be any grammatical nor spelling errors and all reviews are written in very concise language. This tremendous 100% varietal wine hails from Oakville and was aged over three years in oak. Juicy red-cherry fruit and a compelling hint of caramel greet the palate, framed by elegant, fine tannins and a subtle minty tone in the background. Balanced and rewarding from start to finish, it has years ahead of it to develop further nuance. Enjoy 2022–2030. Some of the reviews require wine knowledge to fully understand. In the above example, tannin is a textual element that makes wine taste dry. 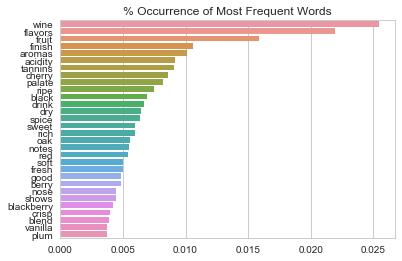 We can also take a look at how frequently the most common vocabulary terms occur. We can map reviews by their points to one of our classes. Unfortunately, our data is not very balanced. There are no reviews in Class 4 (94–97 points — Superb) and most of the reviews are concentrated in Classes 1,2 and 3. Unbalanced classes are problematic, but can be addressed by sampling the larger classes or setting class weights. The total absence of one class, however, is much more concerning. Decision: I will be combining Class 4 and 5 together as the new Class 4. Any reviews in the range or 94–100 points will fall under this class. Should the Textual Data be cleaned? We also have the option of cleaning/normalizing our wine reviews. The biggest factor affecting this decision is the type of learning algorithm we want to use. If we choose to embed each review as its own vector and pass the input into an one-to-one classifier, then we should spend a great deal more time normalizing the text. On the other hand, processing the text sequentially as a representation of many vector makes normalizing less important. Processing the text sequentially (where typically each word is represented by its own vector and word relationships are learned) also helps address word-sense disambiguation (the same word possessing multiple meanings) and identify synonyms. Since the reviews share very similar context with very specific lingo, I am not very concerned about word-sense disambiguation or synonyms. 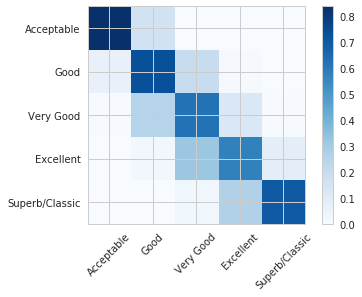 But considering the generally positive sentiment of the reviews, I am concerned that an one-to-one classifier might not be able to pick up the subtle differences between neighbouring classes. Decision: I will be using a Recurrent Neural Network to predict the classes by passing each review as a sequence of vectors. I will also keep text descriptions in their original form. It’s hard to tell if this choice is better than using an embedding technique such as TF-IDF and passing that into an one-to-one classifier. Maybe in the future I will try that too and compare the results. The natural choice for embedding each word as its own vector is to use neural based embedding techniques such as word2vec, GloVe or fastText. We also have the option of training our own embedding model or to use pre-trained vectors. Since the text we are working with is nothing out of the ordinary, using pre-trained word vectors might help us understand language better. Decision: we will use pre-trained word embeddings. But which family of embeddings shall we use? I will eliminate fastText right away as its builds word vectors by summing vectors of character n-gram level. Since the type of text we are working with is not likely to contain out of vocabulary words (no misspellings, unusual slangs or abbreviations), it will not benefit from this granularity. Even so, it’s often hard to identify which technique will work best. Since I find some of the wine descriptions to be analogous in nature, I will opt for GloVe in hopes that learning from co-occurrence structures will help better understand semantic comparisons. Several pre-trained GloVe word vectors can be downloaded here. I will be using the Common Crawl with 840B tokens as it contains the largest vocabulary and is also case sensitive. Each word vector from glove.840B.300d has 300 coordinates. Before loading in the pre-trained embeddings, we should define some fixed parameters and load the required libraries. max_len: the maximum length (in words) which will be considered in a text description. Any descriptions with more than 100 words will be truncated. Any descriptions with less than 100 words will be padded to meet this length. class_weights: we observed earlier that our classes are not very balanced. Classes with higher weights attached to them (class 0 and class 4) will have a higher impact on the learning algorithm. Each instance of class 0 is treated as 7 instances. We also have to one-hot encode the target class. The Kaggle repository provides two data sets of wine reviews. The earlier set will be used for training purposes and the later set will be used for testing. It can still be a good idea to divide the training set into training and validation for the purpose of parameter tuning. I will be using Keras’s text_to_sequences method to preserve the word sequence of the text. Each word will be mapped to its vector from the pre-trained word vectors. Any descriptions under 50 (max_len) words will be padded and any descriptions over 50 (max_len) words will be truncated so that the input is the same length. Words found in the text that do not appear in the vocabulary of the pre-trained word vectors will be initialized to the zero vector. Note: If there are many words outside of the vocabulary, then it might be worthwhile to devise a more intelligent mapping function. Since the text descriptions are generally short, I will be using GRU units as opposed to LSTM units. With shorter descriptions, we have less need for a memory unit and can benefit from GRU’s more efficient learning algorithm. I will also be utilizing early stopping, which (in this case) uses validation accuracy to determine whether we should continue training the network. When validation accuracy continuously drops over several epochs, early stopping will kick in and end the training process. It will also save the optimal weights as a “checkpoint” (in this case as model.h5) and rewrite the weights if accuracy improves. With early stopping, we can let the network train for many epochs without worrying too much about overfitting. The patience parameter is a threshold used to determine if/when to prematurely end training. Patience = 3 indicates that an early stop will be initiated if there are no improvements to validation loss after 3 epochs. The structure of the Recurrent Neural Network is quite simple. The network has one bidirectional GRU layer with 50 units followed by a pooling, dense and dropout layer. Bidirectional means that the network will learn the text sequences in their original order as well as the reverse order in which the words appear. The classifier is also optimizing on accuracy. Accuracy does not differentiate between incorrect predictions the way a human might. Predicting a Class 0 as a Class 4 will no doubt be worse than predicting a Class 0 to be a Class 1. For future implementations, it might be worthwhile to look into creating our own metric. It’s time to assess our model — let’s bring out the test set! Let’s take a look at the confusion matrix. In this matrix, the values are measured as percentages to reflect the unbalanced nature of our data. Next Post:Can a machine learning model detect flirty text messages more accurate than humans? I bet it does!